Thief on the cross, thief on the cross! My best friend in high school was Robert Pelfrey. He was a committed Christian, and one of the coolest people I have ever known. Robert was six feet, six inches+ tall. He had long hair. He played lead guitar in a heavy metal band. He did not have a driver’s license, but drove around town in a giant gas guzzler with a broken speedometer. He was brilliantly smart, though I can’t say he always applied himself fully to his school work. And while he was physically imposing, he was one of the kindest, most gentle men I would ever meet. Robert loved to argue with his fellow Christians, especially of the legalist variety. We would be sitting in the band hall, or the theater, or a classroom, and this conversation would begin. 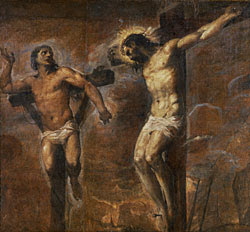 Robert: “What about the thief on the cross? Robert: “So all he did was ask Jesus to ‘remember me when you come into your kingdom.’ No repentance, no prayers, no baptism, no profession of faith. And Jesus said “you will be with me in Paradise.” What about him? Legalist Kid: “To go to heaven you have to repent, and ask Jesus into your heart. Everything that Jesus taught, including our entrance into eternal life, came down to our trust in him. Sinners prayers, baptism, repentance, right theology, right action, loving our neighbors--all of these things are good and godly and right. But more than anything else, Jesus is looking for hearts that trust him. And when we don’t trust him, he loves us so much that he gives us the trust we need. That is what the theologians call “grace.” I need that grace, and I ask for it every day of my life. Can I Have That When You Die?